Restaurant on the great Po river. Lido Ariston Sales is best known for its traditional Cremonese dishes. The first courses of fresh pasta filled with traditional ingredients have been prepared for over thirty years by the skillful Tilde. Second courses are a careful choice of the best meat, such as locally raised hens and ducks and the best river fish such as "ambolina del Po, catfish and eel", the white sturgeon of Calvisano and perch. 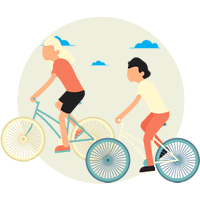 In collaboration with the Strada Del Gusto Cremonese, a free bike sharing service is available, including 2 men's bicycles, 2 women's bicycles and 2 children's bicycles.